At Last, The Health Benefits of Green Tea but the Taste of a Fruit Tea! 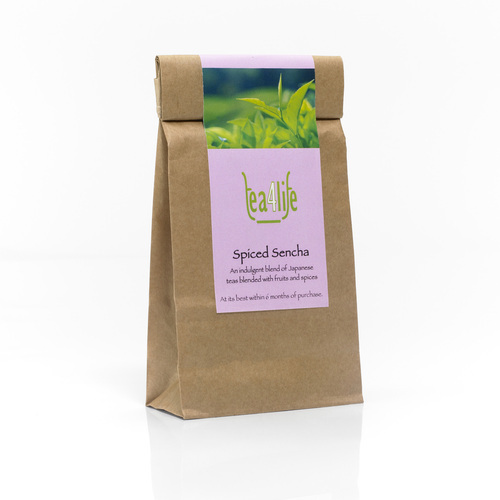 Introducing “Spiced Sencha” the latest hand-blended, speciality tea from Tea4life. We have taken two powerful health boosting green teas, Sencha and Genmaicha and combined them with a seriously delicious blend of fruits and spices - orange, plum, cherry, cinnamon, ginger and vanilla. The result is a glorious fruit tea infusion with all the antioxidant benefits of green tea! Spiced Sencha is a must for those who are unsure about the taste of green tea but still want the health benefits, or for those avid green tea drinkers looking for an exciting change.